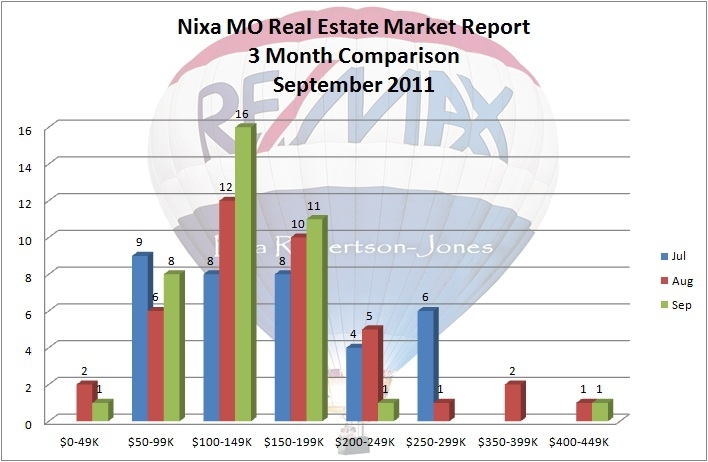 Below is the Nixa MO Real Estate Market Report for September 2011. This month's report shows a continued STRONG surge in the number of homes going under contract in the $100-150K range. Additionally, this month, there is a surge in the number of homes going under contract in the $200-250K range. Overall, the number of homes sold remained unchanged. Sales are up in comparison to last year for homes priced under $200K, but sales remain practically non-existant for homes priced above $200K. 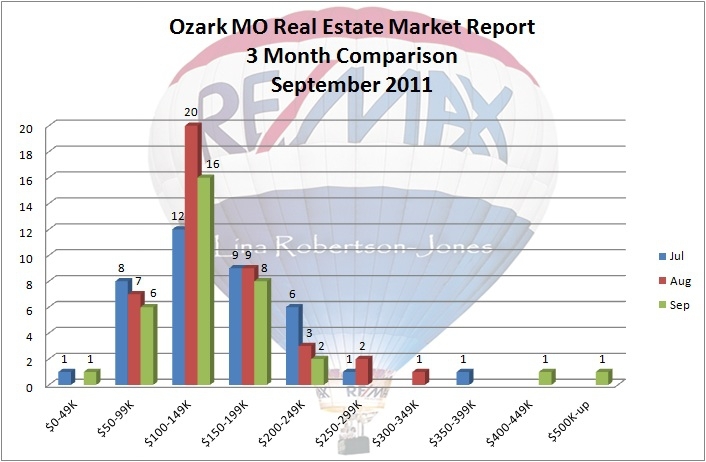 Below is the Ozark MO Real Estate Market Report for September 2011. This month's report shows very little change in most price ranges, but an INCREDIBLE SURGE in contracts for homes priced from $200-300K! Very encouraging for next month's numbers. Comparitvely, home sales this year are up from the past two years. 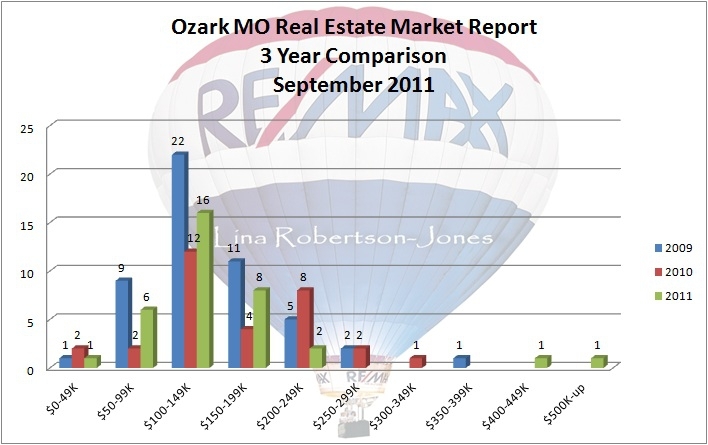 Ozark's real estate market continues to be strong, which is great news for homeowners considering selling in this community. 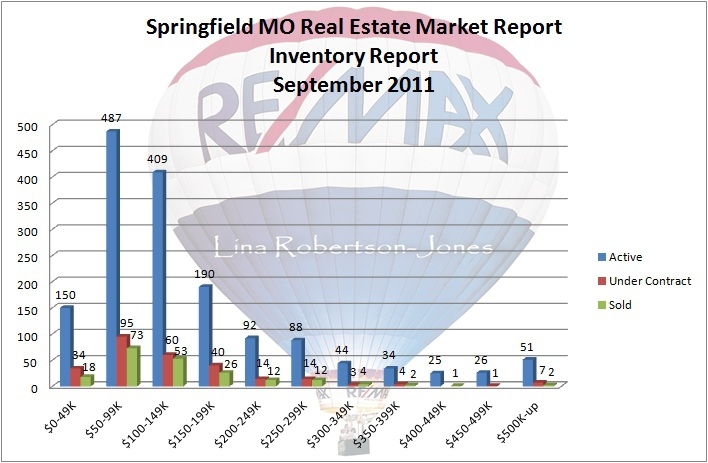 Below is the Springfield MO Real Estate Market Report for September 2011. The market is consistently showing signs of improvement in every price category, with the exception of homes priced from $300-350K, and $400-450K. The one deterring factor that is becoming glaringly obvious is the number of homes going under contract versus the number of homes actually closing. This is due to a variety of reasons such as inability to sustain financing, home conditions failing to pass inspections, and the overall reluctance of buyers to commit. 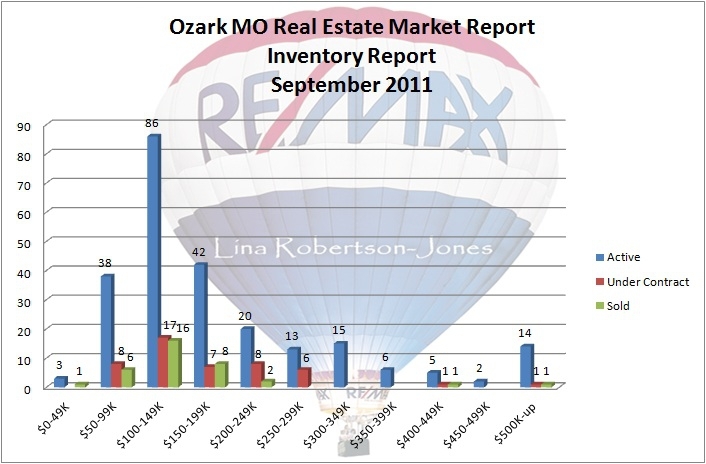 Searching for open houses in the Springfield, MO, area? Below is a list of all open houses in the metro Springfield area, including Ozark, Nixa, Republic, Rogersville, and Willard. A couple of years ago I joined a local BNI group in Ozark, MO, The Buck Starts Here. If you're not familiar with BNI, it's a group of local business owners who meet once a week with the sole purpose of referring business to each other. 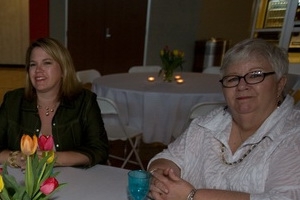 About a year ago, Janice Markley joined our group. There really is no way for me to describe Janice....you'd have to meet her in person to really understand how truly unique and amazing she is. Janice is one of those rare people who truly care about others more than herself, but it's her enthusiasm and excitement for her work that sets her apart from others. Sometimes I wonder if we're going to have to strap her down to her chair. As excited as she is about her business, she's even more excited about everyone else's. She embodies the ideal of "giver's gain." 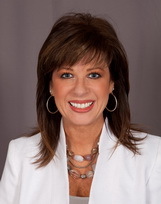 Janice is a representative for Noevir Skin Care products. Not just "a representative," she happens to be the top representative in all of North America! 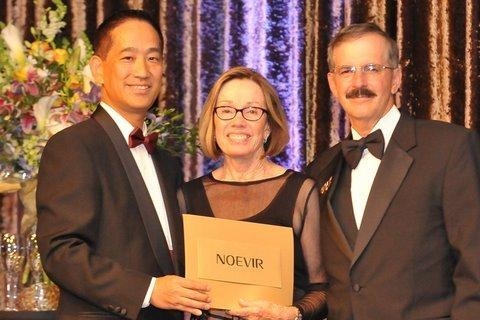 Noevir is a company founded in Japan, that uses all natural ingredients for their products. They have mastered their formula to be as close to our own skin as possible. I think I've tried every skin care product known to man, but I agreed to take a sample kit home and try it. Not only did I love it, I called Janice and asked for two more sample kits for my Mom and an agent in my office to try as well. They're addicted to it now, too. I wondered if Janice would be very successful in our group since more than half of our members are male. Don't laugh, but it's actually the construction guys, work-outside-all-day, most masculine members of the group who have become Janice's biggest fans. Evidently, her hand moisturizer is so powerful that it can heal even the most calloused, cracked construction worker's hands. Her lip moisturizer is another big hit with the men, as well as the sunscreen....you know, for those "follicle-challenged" men who don't have any hair to shield their heads from the sun. What I found is that when you use this product that is so natural to the skin, it doesn't take much at all. My first purchase lasted SIX months! When I went back and averaged what I was paying for Lancome, or even the Oil of Olay, I realized that I was saving money using Noevir. The best part of Noevir is that all I ever have to do is call Janice, and I have whatever I need practically in the blink of an eye. She doesn't forget your order, she always follows up to be sure you're happy with the product, and always has a solution for whatever skin care problem you have. I won't betray Janice and tell her age, but let me tell you....if I even had a fraction of her energy, enthusiasm, drive and determination at my current age...I'd be setting this world on fire! Fair warning...Janice's awesome customer service may spoil you. Last year, I worked with a really great family. Josh and Rebecca Chrestman moved to Springfield, MO, from Albuquerque, New Mexico, because they wanted a better environment to raise their children. Josh worked in the automobile industry, and Rebecca had just received her Doctorate in Acupuncture. They came to me to buy a home in May of 2010. 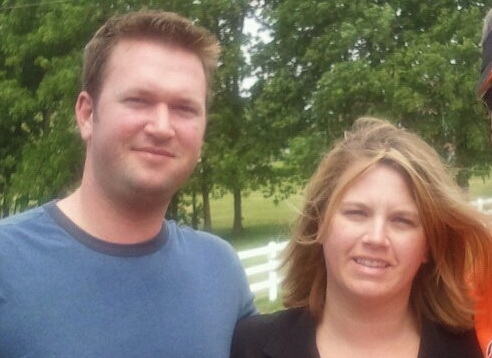 After months of searching, I had gotten to know them and their two children, Caleb and Maddie, very well. It didn't take long to see that Josh was a very proud, incredibly hard-working man, often working late, long hours, to provide for his family. Josh took his role as head of the household very, very seriously. They closed on their new home in February of this year. 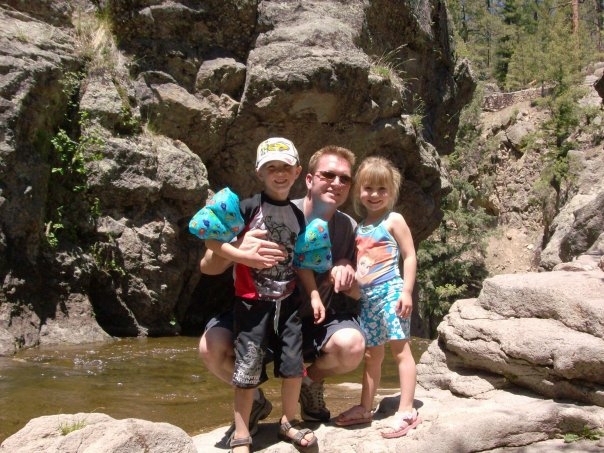 During their home search, Josh's parents, Mike&Chris, flew in from Albuquerque a couple of times. After watching the market, Mike and Chris decided to go ahead and purchase a home now, while home prices were low. Mike Chrestman was a man's man, full of wisdom, and always in perfect control. His strength was powerful, and his love for his family was equally as strong. And finally, Rebecca's mother, Jane, decided she, too, would move from Albuquerque to Springfield. Jane was divorced, and very nervous at the idea of leaving behind her life and home to move to an area where she didn't know anyone except her children. But her love for her grandchildren was stronger than her fears. During the contract on her home, I received a call from Mike Chrestman. Jane was not a Chrestman by name, but Mike made it very clear that she was a part of their family....and the Chrestman men always take care of their family. By the end of March, all 3 had closed on their homes, and I had gained new friends. When I think of the Chrestman family, the word "client" no longer comes to mind. The word "friend" does. And I love each one of them dearly. On September 11, 2011, Josh went to Kansas City for a work-related event. After checking into the hotel, Josh decided to check out the pool. Josh dove into the pool and sustained a traumatic spinal cord injury, crushing his C4, C5 and C6 vertebrae, and damaging both main arteries that run to his brain. He has undergone several surgeries, and has a few more to go. The initial prognosis was that Josh would never use his arms or legs again. The Chrestmans believe Josh is strong physically, mentally, and full of heart, which will help him make a full recovery from this tragic accident, On Friday, Josh was taken off the ventilator, all equipment was removed from his face, and when they sat him up, Josh was able to hold himself up for 10 seconds on his own. He even managed a wink and a smile. I think the doctors are going to learn what the rest of us have....NEVER underestimate a Chrestman! In the meantime, Jane is staying at Josh and Rebecca's home and taking care of their two children. Bills are piling up, house payments need to be made, the yard needs to be mowed, and the children will be needing new winter clothes. Because Josh and Rebecca are unable to work at this time, the financial burden is one more hardship they are having to endure. 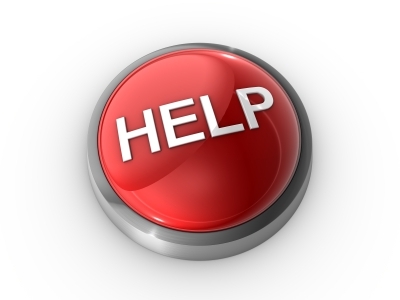 If you would like to help contribute, please make your contribution through the instructions on Josh's Facebook Support page. There is no amount too small, and any help would be greatly appreciated. The love and care provided to this home over the years is evident from the moment you walk in. This well-maintained 2 bedroom, 1 bath home, features a cozy kitchen with lots of cabinet space, dishwasher, and wall oven, tons of natural light, newer carpet and flooring, an unfinished basement with storage space galore and built-in shelving. The water heater, floor furnace, roof and electrical panels are all within 5 years old. Outside are gorgeous mature trees, a 2 car carport, large parking pad, patio area, and it has a maintenance-free exterior. Someone asked me today if the average sales price has gone down this year over last year. I wasn't sure, so I pulled the data from the MLS and prepared the chart below. Basically, there is no rhyme or reason to the average sales prices over the past couple of years. If you factor in the First-Time Homebuyer Tax Credit of last year, you can see that the average sales price naturally dropped during that period of time, which is undoubtedly due to the average sales price of that particular buyer. However, that correlation doesn't explain this year's drop in sales price during the same period of time. So, I don't think that we can attribute much to the tax credit. It appears that the average sales price naturally drops during that time of year. Overall, it looks as if the highest average sales price occurs in June, due to contracts written in May. 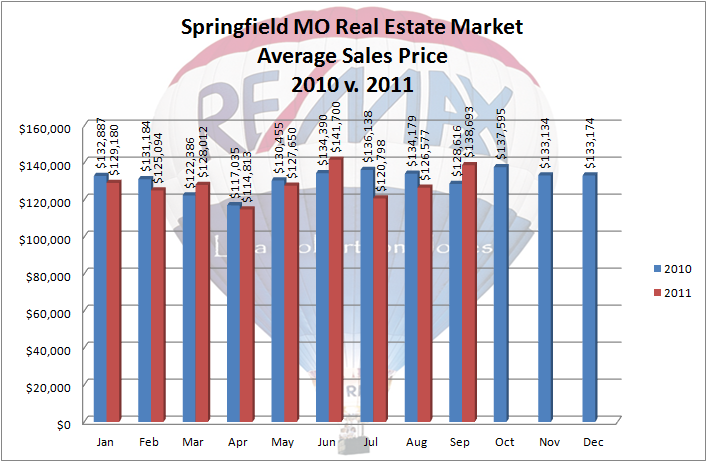 I am encouraged by the rising average that has occurred in the sale prices over the past three months. The activity in our market is definitely on the upswing, and that is evident in this data. 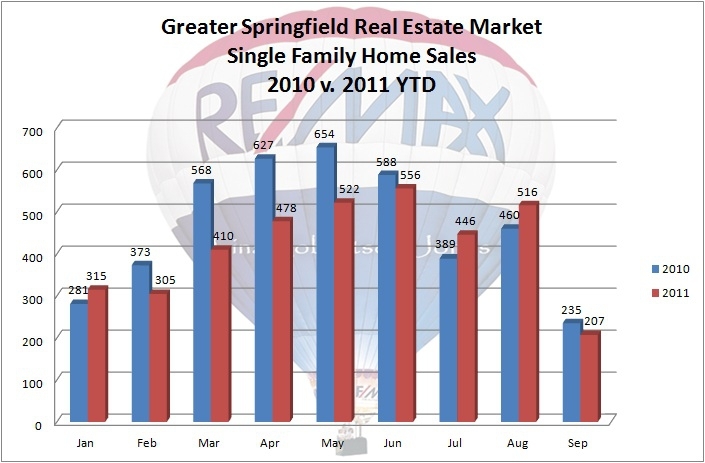 Whether you're in the market to buy a home, or sell a home, in the Springfield, MO, area, it is important to be educated on the local real estate market trends. Let me and my team analyze the data, and provide you with the knowledge you need to be able to make an educated and informed decision on your next real estate transaction. 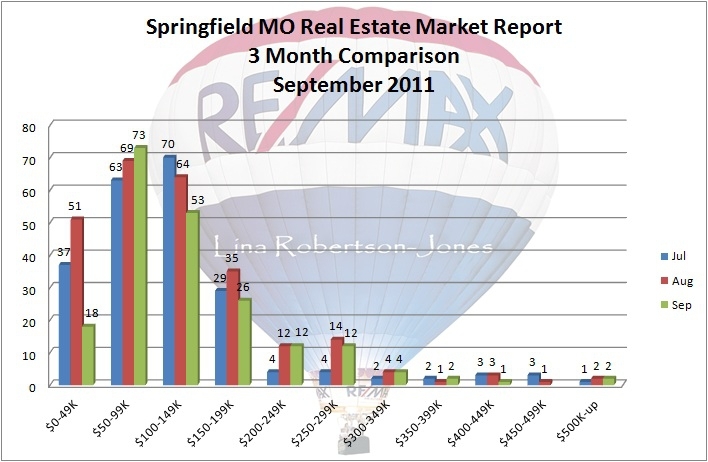 The Greater Springfield, MO, area has been the fastest growing area in the State of Missouri for the past 10 years. With the downturn of the real estate market, new construction was the first segment of the market to be affected. Most builders stopped completely. Others tried to continue on, but were caught in the continued downturn and eventually went bankrupt. Those builders that survived continue to build, but not at the rapid pace of the real estate boom from 2003 to 2006. It is becoming increasingly more difficult to find a new construction home, or even a home less than 5 years old for that matter. 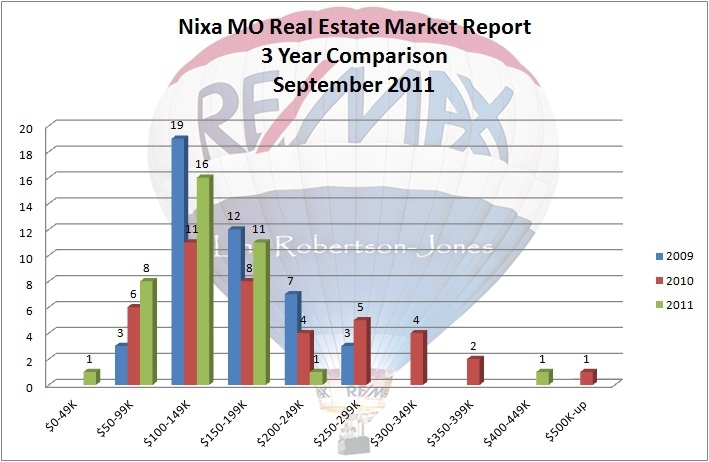 The chart below details the number of home sales for 2010 v. 2011. 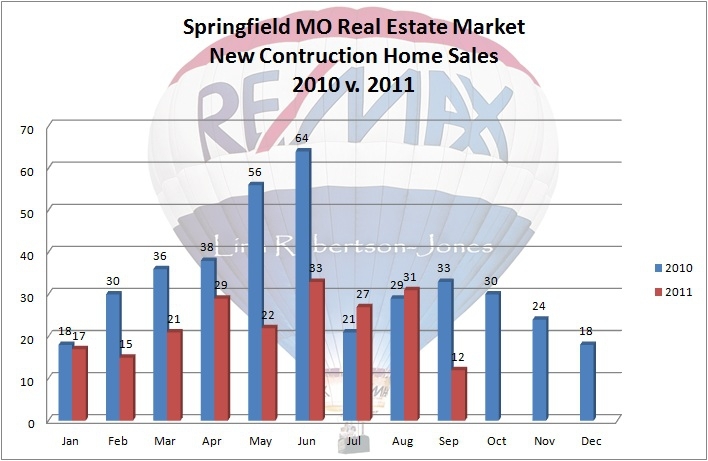 You can see the reduction in the number of new construction homes sold. The inventory has decreased as well because it is difficult for a builder to be able to compete with the prices of the existing homes and foreclosures. 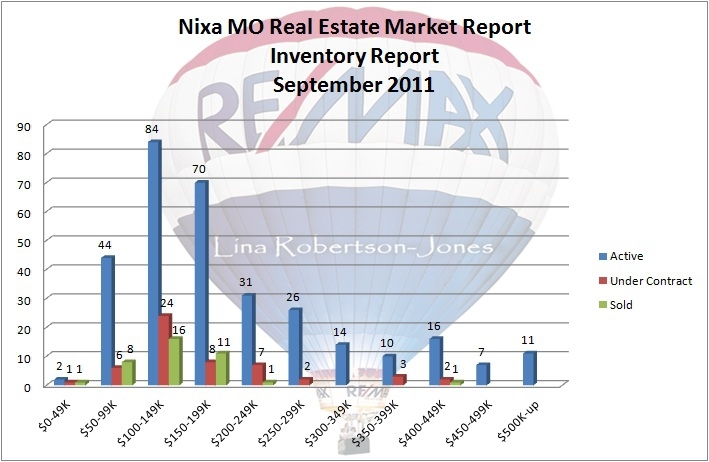 But there are still buyers in the market that are not finding what they want....even with the large inventory available. For those buyers, a new construction home is still a desirable option, especially with today's fantastic interest rates. If you are considering building a new home, be sure to check with a local REALTOR® who is familiar with the business practices and reputations of the builders in the area, and can help guide you through the construction process and ensure that your rights are protected. 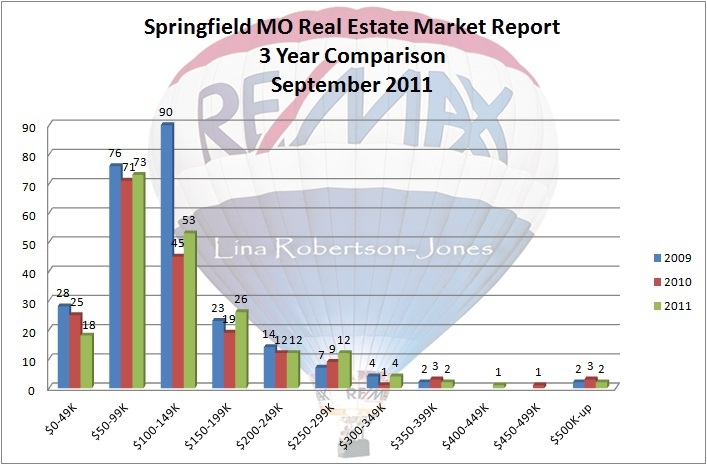 Want to know how the 2011 real estate market in the Greater Springfield, MO, area compares with the real estate market in 2011? Below is a chart which shows the total number of single family home sales per month for each year. I was surprised to see that until the past couple of months, our sales were actually down in comparison with last year. Much of this is attributable to the first-time homebuyer's tax credit. Once the tax credit ended, it was literally months before we began to see first-time home buyers have much of a presence in our market again. It appears that we have turned a corner, and a new market is emerging with the re-introduction of the first-time home buyers in the game. This will help our market tremendously in that many homeowners will now be able to purchase the next step up, and hopefully sales will continue to improve in the higher price ranges as well. Great news for sellers! If you are interested in selling your home in the Springfield, Ozark, Nixa, or Republic areas, call me for a free consultation.